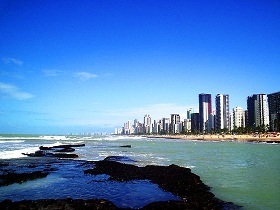 Brazil is the largest country in South America located in the North East bordering the Atlantic Ocean. The territory has a land area of close to 3.3 million square miles and a population of over 190 million. The population density is fairly modest at about 57 per square mile. Brazil is the fifth largest country in the world and is geographically diverse – the terrain has hills, mountains, and plains although most of it lies between the elevations of 660 ft and 2600 ft above sea level. The upland lies in the southern half of the country and parts of the area get snow while the northeast enjoys tropical climate. Brazil’s per-capita GDP is around $1000 making it a solid middle-income country. The country grew at a steady clip over the last two decades with some glitches along the way. The country is projected to become one of the five largest economies in the world in the coming decades as they leverage the wonderful combination of huge natural resources and large labor pool. Brazil gets visitors year round from all over the globe. Given the enormity and the lay of the land it is difficult to pick a best time or a best place. Its palette is extensive - The Carnivals, Iguassu Falls, Amazon rainforests, Megacities such as Rio de Janeiro, Sao Paulo, Sao Luis, Brasilia, and colonial cities like Ouro, Preto and Olinda are just the beginning of a long list. Both Sao Paulo and Rio offer the best of nightlife with thriving samba clubs featuring live music. Day trips and tours can be arranged for the national parks and resorts. Like the country the cuisine also varies greatly by region. Rice and beans along with fish, beef and pork are very common. Cassava, yam, papaya, guava, passion fruit, and orange are ingredients in their cooking. Brazil Eyewitness Travel Guide 978-0756662004 $20 Detailed region-wise coverage along with around 70 pages covering practical information for travelers. Frommer’s Brazil 978-0470591512 $16 Itineraries, walking tours, and trip-planning ideas. Good practical information although hotel and restaurant recommendations are comparatively few for any given area. The Brazil Reader: History, Culture, Politics by Duke University Press Books 978-0822322900 $21 A collection of short essays on Brazil that explains the history, culture, and values of Brazil. Also includes photos, maps, and illustrations. Laminated Brazil Map by Borch 978-3866093645 $12 Folded Laminated road and travel map at 1:4,000,000. Includes inset map of Brasil Amazonico (1:8,000,000), Brasilia (1:60,000), Manaus (1:15,000), Natal (1:22,000), Recife (1:15,000), Salvador (1:14,000), Curtiba (1:15,000), Florianopolis (1:15,000), and Porto Alegre (1:15,000). The first stamps of Brazil are the famous Bull’s Eye (Scott #1 to #3) which was issued starting August 1, 1843 in the three different denominations. The name comes from the design of the value figures inside the oval settings whose se-tenant pairs looked like bull’s eyes. The 60r denomination is the most common and catalogs for around $600 for MNH and about one-third that for used. The most valuable is a unique vertical strip of 3 termed ‘Pack Strip’ consisting of two Scott #1’s and one Scott #2 which catalogs for around $850,000! The set catalogs for around $6500 MNH and around $2000 for used. Similar nicknaming of early Brazilian issues continued in 1844 with the issue of a set of seven stamps (Scott #7 to #13 – Inclinados). The stamps in this set are smaller, rectangular in shape, and the numerals are imprinted in slanting fashion. The issue is appropriately nicknamed Snake’s Eyes. The set catalogs for around $15000 MNH and around one-third that for used. The third set of Brazilian stamps was issued in 1850 following the same general design concept. The set of eight (Scott #21 to #28) in denominations that ranged from 10r to 600r are smaller and rectangular compared to the Bull’s Eye issue and is nicknamed Goat’s Eye. The set is also extremely valuable and catalog close to $1000 MNH and around one-third that for used. A sister-set of two stamps (Scott #37 & #38) using blue ink was also issued in 1854. This set is comparatively affordable at around $45 for MNH and slightly more for used. The stamps are nicknamed Cat’s Eye. A set of two stamps (Scott #39 and #40) released in 1861 using a very similar but simpler design than the earlier ‘Eye’ stamps. The issue comes in two denominations – 280r (Red) and 430r (Yellow). The nice set is fairly valuable at around $400 for MNH and around half that for used. A set of ten stamps (Scott #68 to #77) released in 1878 depicting Emperor Dom Pedro in different colors and denominations that ranged from 10r to 1000r. The set catalogs for around $750 MNH and under $200 for used. Emperor Dom Pedro dominated the theme of Brazilian stamp issues during the period from 1866 to 1885. Many of the stamps are very valuable but used copies of the smaller denominations can be had for a few dollars. A set of ten stamps (Scott #99 to #108) released in 1890 showing the Southern Cross (Crux), a circumpolar constellation consisting of 4 main stars forming a roughly cross-shape easily visible from the southern hemisphere any time of the year. The set catalogs for over $500 MNH and around $50 used. Southern Cross has strong cultural associations in the countries in the southern continents, especially Brazil and Australia. It is depicted in the Brazilian Coat of Arms, on the logo of the Brazilian soccer team, and also in the lyrics of the Brazilian National Anthem. A set of four stamps (Scott #162 to #165) released on January 1, 1900 to mark the 400th anniversary of the discovery of Brazil. The set catalogs for around $30 MNH and $25 used. The designs show the arrival of Pedro Alvares Cabral at Brazil, Proclamation of Independence, Emancipation of Slaves, and Republic of Brazil Allegory. Cabral is regarded the European discoverer of Brazil. The other themes show other important events in the history of Brazil. A long set of twenty two stamps (Scott #236 to #257) released between 1922 and 1929 in the Brazilian Trade theme. The set catalogs for around $375 MNH and $60 used. The denominations vary between 10r and 1000r and come in five designs – railroad, industry, aviation, Greek God Mercury who is associated with trade, and navigation. A long set of eighteen stamps (Scott #512 to #529) released in 1941 in a combo-theme of industry, commerce, armed forces, and great men. The set catalogs for around $100 MNH and around $25 used. A set of five stamps (Scott #635 to #639) released on July 18, 1945 to mark Brazilian involvement in World War II and honoring the Brazilian Expeditionary Force and the US 5th Army Battle against the Axis in Italy. The set is affordable at less than $10 for MNH and around $2 for used. The designs are the emblem of the US 5th Army, emblem of the Brazilian Expeditionary Force (B.E.F), US flag and shoulder patches, and Brazilian flag and shoulder patches. A set of two stamps (Scott #1080 and #1081) released on April 22 1968 and July 11 1968 respectively to commemorate the following important events in Brazilian history: 500th anniversary of the birth of Pedro Alvares Cabral, the navigator who took over the territory of Brazil for Portugal, and the First Mass Celebrated in Brazil in 1500. A set (Scott #1087 to #1089) of three stamps released in 1968 in a beautiful multi-color design. The designs show musician wren, red-crested cardinal, and the royal flycatcher. The set catalogs for around $5 MNH and $1 used. A souvenir sheet of four stamps (Scott #1130a-d) released on July 24, 1969 to publicize the work of ACAPI, an organization devoted to the preservation and development of fish in Brazil. The sheet catalogs for around $10 MNH or used. Individual stamps catalog for around $2. The designs show tetra, piranha, megalamphodus megalopterus, and black tetra. A stamp (Scott #1143) released on November 23, 1969 publicizing the year of the expansion of the national aviation industry. Brazil continues to be a globally relevant player in the aviation industry due to this early effort. A stamp (Scott #1144) and a souvenir sheet (Scott #1145) released in 1969 to commemorate the thousandth goal (all competitions) scored by Pele (November 19, 1969). This was an event of national significance in Brazil. The goal is termed ‘O Milesimo’ and was scored in a match against Vasco da Gama from a penalty kick. The stamp is very collectible and surprisingly affordable at less than a dollar for MNH and 30c for used. The Souvenir Sheet commands a premium at around $10 MNH and $3 used. The Souvenir Sheet consists of the same stamp (imperf) with simulated perforations. A set (Scott #1383 to #1389) of seven stamps released on April 18, 1975 in the ‘Brazilian Architecture’ theme. The set catalogs for around $25 MNH and $17 used. The designs show modern houses and a plan of Brasilia, house on stilts from the Amazon Region, Indian hut of Rondonia, and German-style cottage called Enxaimel of Santa Catarina. A set (Scott #1801 to #1803) of three stamps released on June 4, 1982 in the ‘Animals’ theme. The set catalogs for around $3 MNH and less than a dollar used. The designs show armadillo, wolves, and deer. A beautiful set (Scott #2370 to #2373) in a multicolored background released on June 4, 1992 in the Ecology theme to mark the UN conference on Environmental Development held in Rio de Janeiro. The set is very affordable at around $2 for MNH or used. The designs include flowers, waterfalls, butterflies, canoe, hummingbirds, boy taking pictures of tropical birds, armadillo and girl picking fruit. The first coins of Brazil were countermarked varieties of Portuguese and Spanish reales that went into circulation around 1640. Starting around 1580, Portuguese coins along with money from different nations including the Spanish reales were used as currency. The first mints were established in 1694 by Dom Pedro II when all gold and silver coins were mandated to be sent to the Mint to be exchanged for provincial coins. The Pataca series of silver coins and gold coins in 1000, 2000, and 4000 Reis were minted in this era. Shield Countermarked Coins that doubled the valued of the earlier Portuguese Colonial coins were issued in 1809. Other major evolutions in coinage in the 19th century include the Empire Copper Coinage during the decade that started in 1823, Silver and Gold Standard coins issued in the same period, Reform Coinage during 1834 to 1889 time-frame, the Republican Era Coinage that started in 1889, Cut and Countermarked coinage during the war of the triple alliance around 1864, and regional countermarked coinage of Mato Grosso, Cuiaba, Minas Gerais, Ceara, Maranhao, Para, and Piratini. Coins $1 and up Common UNCs start around $1. Countermarked varieties from the 1820s in VF start around $10. 19th century silver coins in UNC start around $50. Recent Commemorative Silver Proofs, certified MS60 and above empire era silver coins, etc start around $100. Gold coins go well into the 100s and 1000s depending on bullion value and rarity. Paper Money $1 and up Common UNC notes start around $1. Commemorative UNCs from the 1980s start around $5. Recent UNC bundles start around $50. Specimens and Replacements from the 1970s and prior dates start around $100. Polymer Bundles from 2000, 1920s specimens, etc go into the $1K range. Brazil is known for its precious and semi-precious stones making jewelry a choice takeaway. Authentic Brazilian art and handicrafts are well sought out too. Gemstones $1 and up Agate, Citrine, and a few other natural stones start around a dollar. Certified Emerald and other natural untreated Gemstones in the 4 ct. range go well into the 100s and more. Art $20 and up Vintage 19th century photo prints start around $20. Carnival Travel Posters from the 60s go well into the 100s. Original signed paintings and sculptures from well known artists go into the 1000s. Antiques $10 and up Antique 19th century maps start around $10. Amazon Indian masks and figurines go into the 100s. Complex Amazon Indian articles such as blowpipe containers, hunting sets etc. go into the 1000s.